Making marinara sauce from scratch? Marinara (mariner’s) sauce is a southern Italian tomato sauce usually made with tomatoes, garlic, herbs (such as basil), and onion. Italians refer to marinara only in association with other recipes. For instance, spaghetti alla marinara literally translates to mariner’s spaghetti. However, tomato sauce alone in Italy is called salsa al pomodoro or pummarola. Heat oil in a sauce pan until it shimmers. Saute onions and garlic over medium heat for about 2 minutes until onions are translucent. Add the thyme, basil and bell pepper. Add the tomatoes and sugar. Bring to a boil and then lower to a light simmer, stirring occasionally for 30 minutes. Serve hot by ladling over pasta, seafood or rice. 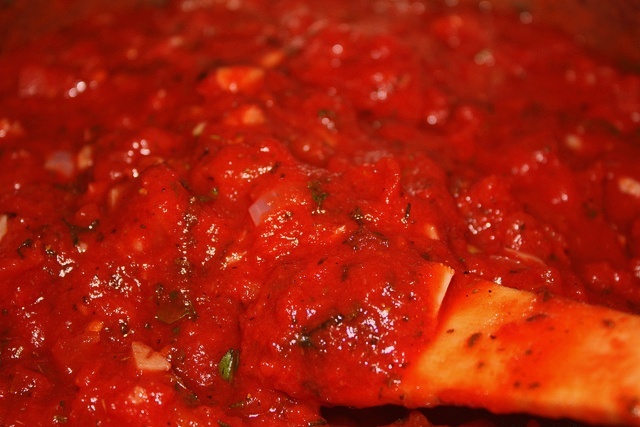 This is a simple marinara sauce, good over any pasta or on lasagna!